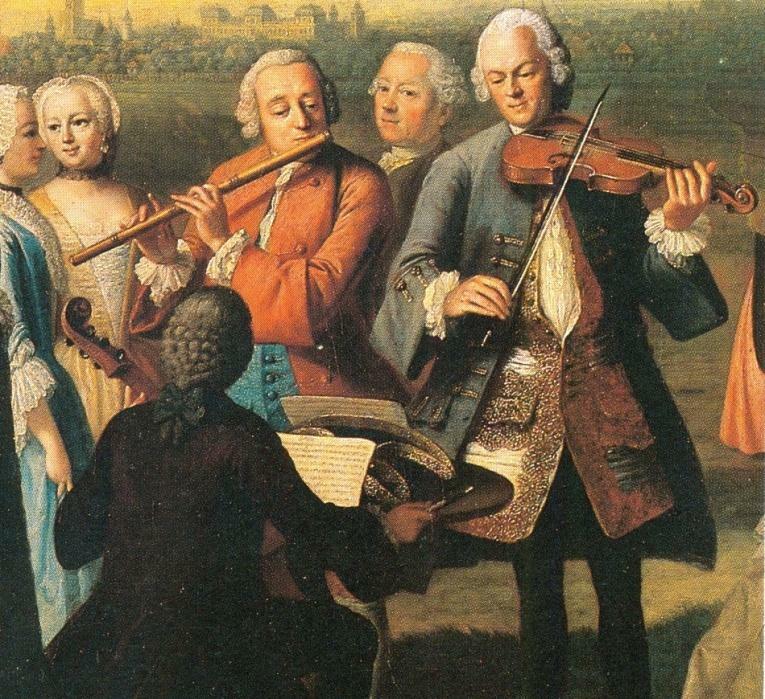 The early music ensemble Melante’s Band specializes on the performance of baroque and pre-classical music with special focus on compositions involving woodwinds by G. Ph. Telemann, J.S. Bach and their contemporaries. It takes its name from Telemann’s preferred Italianate anagram “Melante” which he used between the years 1712 and 1733 on numerous manuscripts and printed collections. The group was created in The Netherlands and its members are young musicians from Australia, Czech Republic, Mexico, Poland, Spain and Japan. They have studied historical instruments and performance practice in Dutch conservatories such as The Hague’s Royal Conservatory and Conservatorium van Amsterdam. The group has appeared in the Netherlands, Spain, Czech Republic and Mexico. Melante’s Band was selected to participate in the Spanish early music serie “Antiqva 2011”, giving concerts in various cities and festivals in Spain. Born in the Czech Republic, Eva began her recorder studies in the Netherlands at the Rotterdam Conservatory with Thera de Clerck and Han Tol. Subsequently, she studied at the Royal Conservatory in The Hague with Reine-Marie Verhagen, Peter van Heyghen and Heiko ter Schegget. There, she graduated Bachelor of Music in 2003, Master of Music in 2005 and got in 2006 a Master Degree on Music Pedagogy. 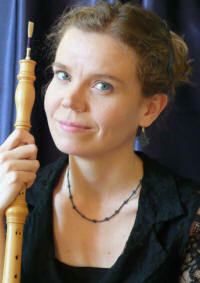 She started taking baroque oboe lessons with Diego Nadra in 2006. Later, she studied with Frank de Bruine at the Royal Conservatory (2006-2011), receiving a Bachelor Degree on baroque oboe. She has taught in the Young Talent Class at the Royal Conservatory, in the Czech Republic (Brno Conservatory; courses in Krom? ?íž, Šumperk, Kel?) and the Netherlands (Koorenhuis Arts School). Eva has played with ensembles like The Northern Consort, Concerto Barocco, Czech Baroque Ensemble, members of the Handel & Haydn Society, Scarabee, Göttingen Baroque Orchestra and Luthers Bach Ensemble (Ton Koopman). In 2009-10, she joined the European Union Baroque Orchestra (L.U.Mortensen, E.Higginbottom, E.Onofri). Eva is co-founder of the ensemble Giardino Musicale and the orchestra New Century Baroque. Born in Mexico City, Roberto studied recorder (Bachelor of Music) at the Music Faculty of Mexico’s National University with M.Díez-Canedo and traverso with V.Touzet. Later, he went to study to the Netherlands with Wilbert Hazelzet at The Hague’s Royal Conservatory and with Marten Root at the Amsterdam Conservatory where he obtained his Bachelor Degree on traverso. He was awarded the grants “For studies abroad Fonca”-Mexico and the Delta Scholarship-NL. He has played with ensembles such as Il Concerto Barocco, Sweelinck Baroque Orchestra, The Académie Mozart Europeéne, Czech Baroque Ensemble, Orkest van de Domcantorij, Giardino Musicale, members of the Handel & Haydn Society-Boston, etc. He has performed in Germany, Spain, France, Czech Republic, The Netherlands, Poland, USA and Mexico at several international festivals. He has been guest teacher in Mexico and the Czech Republic. Roberto is cofounder of Melante’s Band and Eco de Indias. 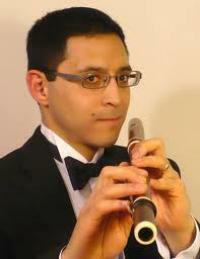 Currently, he’s solo flute of the Luthers Bach Ensemble and member of Scarabee (recorder quartet). He is also focusing on traverso construction after having studied with P.Beekhuizen (TU Delft), M.Root and F.Aurin. Born in Lodz Poland in the year 1976, Tomasz started taking violin lessons at the age of 7. 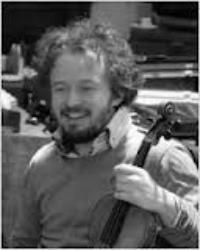 In 2002 he completed his studies in modern violin with Lukasz Blaszczyk at the Bacewicz Academy of Music in Lodz. During his studies, he became increasingly interested in early music. 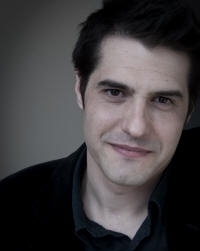 In 2002, he went to the Netherlands to study baroque violin with Elizabeth Wallfisch and Ryo Terakado at the Royal Conservatory in The Hague, obtaining his Bachelor of Music Degree in 2006. Tomasz has attended courses and master classes with Lucy van Dael, Simon Standage, Michaela Comberti and Judy Tarling, amongst others. 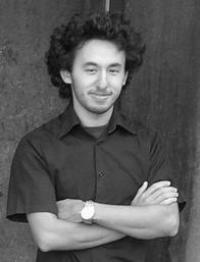 He has performed with baroque orchestras and ensembles such as Florilegium Musicum, Baroque Ensemble De Swaen, Musica Poetica, Contrasto Armonico,Orcheste Français de Jeunes (conducted by Christoph Rousset) and “La clef des champs”, in various international festivals and countries like Slovenia, Croatia, England, France, Spain, Poland and the Netherlands. Most recently, Tomasz has been invited to cooperate with Ad Mosam Ensemble, The Wallfisch Band and Arte dei Suonatori. Born in Perth, Australia, Anton Baba started his music studies on the cello at the age of 6. He also received invaluable musical experience as a member of the St George’s Cathedral Choir which he joined at the age of 7; here, Anton discovered a love for baroque and renaissance music. After being admitted to the University of Western Australia in 2001 studying with Suzie Wijsman, Anton was awarded the Sylvia Davey Memorial Award and the Pauline Steele Memorial Award for excellence in performance. Continuing his studies at the Eastman School of Music in New York, USA with Steven Doane and Rosemary Elliot, he worked with artists like Anner Bylsma, George Crumb, Paul O’Dette and Paul Katz. Currently finishing his Master studies at The Royal Conservatory in the Netherlands with Jaap ter Linden, Anton regularly plays in concerts and festivals across France, Germany, the Netherlands, Spain and Italy. He is a founding member of ensembles Nobody’s Jigg and Den Haag Piano Quintet, and has also been invited to perform with Baroque Ensemble De Swaen, The Wallfisch Band and Ton Koopman’s Amsterdam Baroque Orchestra. Born in Toledo, Spain, Jorge began his studies on piano and later of harpsichord and basso continuo at the Real Conservatorio Superior de Música de Madrid with Alberto Martínez Molina. He received the Artist Scholarship from the Comunidad de Madrid to study in The Netherlands, at the Royal Conservatory of The Hague with Jacques Ogg, completing his Bachelor Degree in 2009 and at Conservatorium van Amsterdam with Menno van Delft. There he took part in projects directed by Ryo Terakado, Christina Pluhar and Charles Toet. He has participated in master classes by Frédérick Haas, Lars Ulrik Mortensen, Christian Rieger and Richard Egarr. He collaborates with ensembles and orchestras for concerts and recordings such as La Capilla Real de Madrid (SP), Orquesta Barroca de la Universidad de Salamanca (SP), Bach Collegium España (SP), Rotterdams Barok Ensemble (NL), Música Temprana (NL), InVento Ensemble (NL), La Folía (SP), Stavanger Baroque Ensemble (NO) and Hippocampus (SP), performing all over Europe and Latin America. He is a founding member of Opera Omnia and L’Attimo.